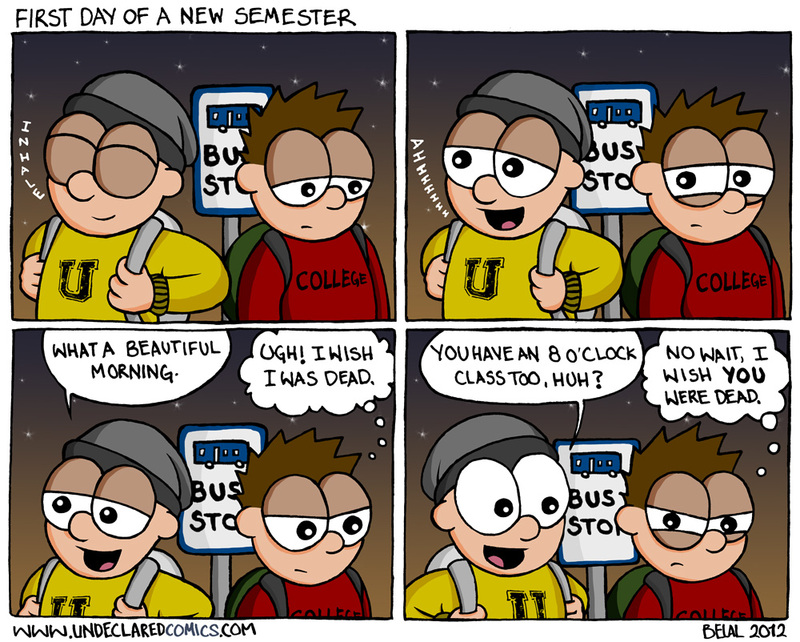 For some of you, unfortunately, Winter Break is almost over – Spring Semester (or whatever your university calls it) is just around the corner. When you wake up for that first 8 AM class next week – you’ll probably be exhausted, confused and nervous – just remember… I’ve still got another week of vacation. Skipping class and sleeping in is enjoyable. I was usually sitting there typing my paper on my laptop or finishing calc hw at the bus stop because i didnt start it until i left my dorm for class…oh college. I just realized why your comics all look so nice…it’s the shadowing. Well done. I love shadows. They’re my favorite byproduct of lightwaves encountering obstacles. Just got into your comics and they’re so funny! This strip is going to be my life in a week lol.